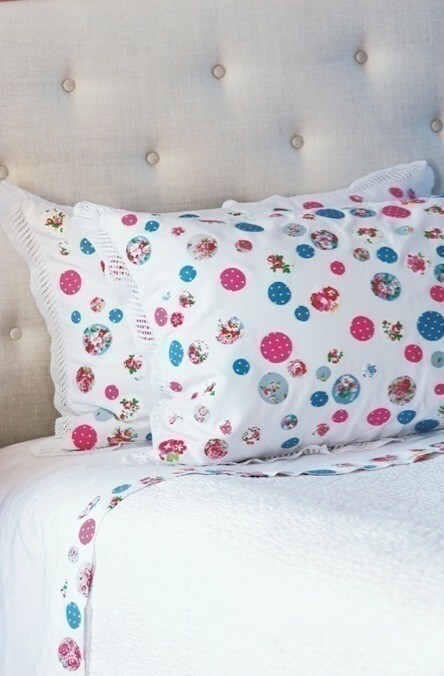 Embellishing bedlinen is a brilliant way of using up tiny odd scraps of cotton fabric. If you don’t want to cover the pillowcase completely, use fewer circles and arrange them as a border or in a simple repeating pattern. © 2019 Cath Kidston / Quadrille · Reproduced with permission. Gather together all your fabric scraps and launder any new pieces. Decide on two colours for your main theme – I went for pink and blue – and pick out a selection of patterned cottons in these shades. Trace the 20 circle outlines onto the paper side of the Bondaweb, using a sharp pencil. The pillowcase uses one hundred circles, so you will need to trace the page five times. Cut out each of the circles roughly, leaving a border of about 5mm around each one. Protect your table with a thick layer of opened-out newspapers covered by a spare folded sheet: this will be your temporary board. Iron the dots onto the wrong side of the various fabrics, choosing the most interesting areas of the printed designs, and cut out along the pencil lines. Spread out your pillowcase on the sheet. Peel off the backing papers and arrange the circles randomly across the pillowcase with the adhesive side downwards. Press them in place with a warm iron. 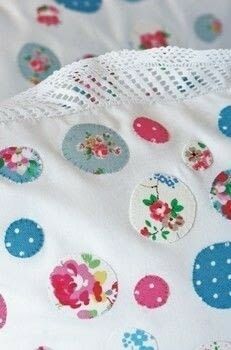 Edge each circle with straight stitches, using matching sewing thread. The edge of the sheet is decorated in the same way. For a narrow border, as shown, cut about 70 circles for a double sheet and about 40 for a single sheet.